Wallsé is an Austrian restaurant located on a typically charming block in the far West Village that has been open for about five years. To be perfectly honest, and I don't mean this in a disparaging way, German/Austrian food is just not something that makes me say: "Hmm, let's have Austrian tonight!" Well, it was a friend's birthday and he said: "Hey, let's have Austrian for dinner!" And so we went. Knowing that the chef, Kurt Gutenbrunner, worked as the executive chef at Bouley (btw, is that not the worst website for a top tier restaurant you've ever seen?) for four years before opening Wallsé, I was actually quite looking forward to a fancy Austrian meal since the food I had when I spent a couple of weeks last year in Germany were all on the cheap and simple side. Actually I think I just remember a whole lot of sausages and one really bad wiener schnitzel (breaded and fried piece of veal, a very typical German dish). The restaurant, named after the small Austrian town along the Danube called Wallsee where Gutenbrunner is from, is split into two small dining rooms. The room where you enter has a bar and some tables and connected through a narrow walkway is the other room, where we were seated. The high ceilinged rooms are classy, though somewhat stark with the white walls and black carpeting. Large colorful yet austere paintings dominate and provide some visual relieve. Huge windows look out over the quiet residential street outside. All in all, very Teutonic I thought. Of course, not everything on the menu was indecipherable for us non-worldly simpletons. There were four pages, one each for the seasonal menu, the appetizers, the entrees and the desserts. I would have preferred a slightly tighter selection but it was by no means overwhelming. 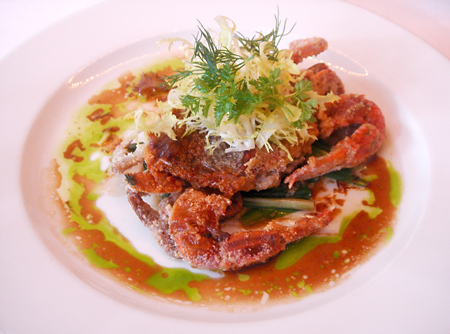 The Almond Crusted Soft Shell Crab ($16), from the seasonal Market Menu, came with sautéed ramps and a spicy marinade. The almond crust was surprisingly absent in taste or texture when eaten, but nevertheless it was a fine rendition of a typical dish. 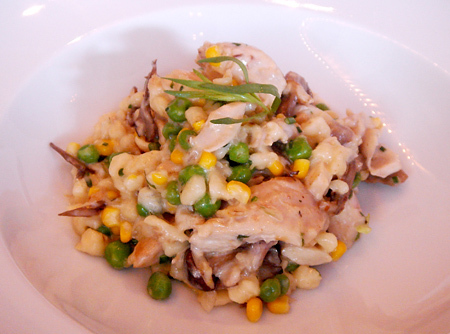 The Spätzle ($15) was a rich and creamy blend of braised rabbit, wild mushrooms, sweet peas, corn and tarragon and little chunks of pasta (the spätzle). The rabbit tasted, yes, like chicken. Nothing wrong with that, I just wondered why they don't just use chicken then? 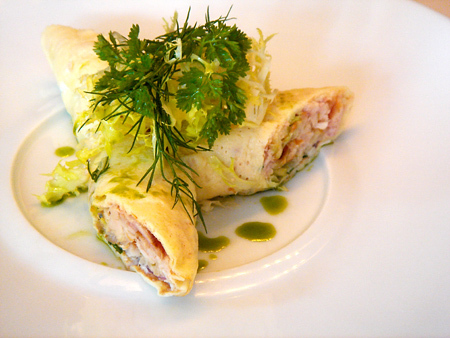 Next up was the Palatschinken ($14) which we learned was a crepe that is filled with smoked trout, apples, horseradish and organic herbs. This turned out to be much more tasty than the Crispy Cod Strudel ($29) entree two of us ordered. 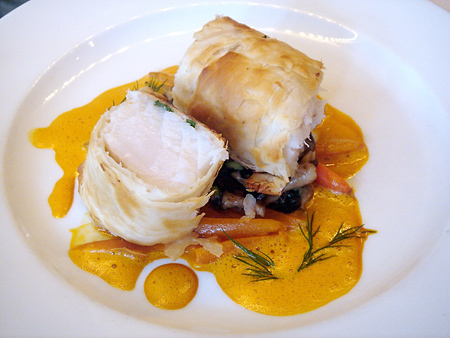 The strudel, a type of Austrian pastry, contains a large filet of cod and it comes with wild mushrooms and a stew of carrots and ginger. And really, it looked better than it tasted. It didn't taste bad, but just very, very boring. It wasn't my dish and I only had about half of one half and I was tired of it before I could even finish my little piece. It was so bland I wondered if they forgot to season it. A better choice was the Kavalierspitz ($29), broiled beef shoulder pieces with apple horseradish on top and potato rösti and creamed spinach on the side. I've never seen creamed spinach that watery, it was like drinking a green soup. Good though. The beef shoulder itself, while plain as heck, was extremely tender and flavorful. And I loved the apple horseradish. 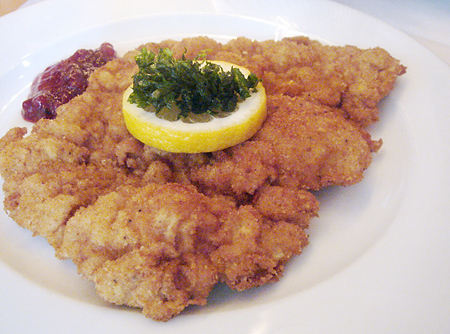 If I thought the beef shoulder was plain, my own entree, the Wiener Schnitzel ($28), was even plainer still. The dish arrived and it was one large piece of breaded meat on a white plate. For a second I thought I was eating in someone's house. Where's the pretty plating? This cost $28? I was surprised that for someone who was in charge of Bouley's kitchen for so long, Gutenbrunner didn't incorporate more French plating techniques to spruce up the presentation to help justify the high prices. I had mentioned earlier that I had some bad wiener schnitzels while in Germany. And boy, did this kick all of their asses. So it looked boring, but, man, was it good. It actually tasted almost fluffy! Yes, a fluffy piece of breaded and fried meat. If I had eaten this in a small town in Germany, I would probably be telling for the rest of my life the story of one of the most memorable meals I've ever had while traveling. 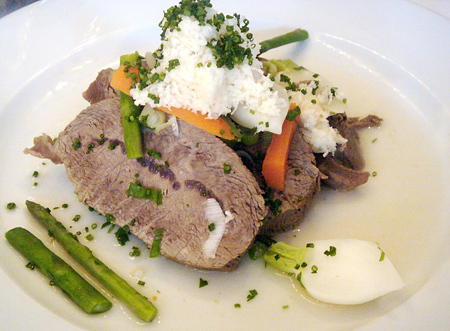 But alas, I had it in a highfalutin restaurant in New York City, paying close to $30 for it. 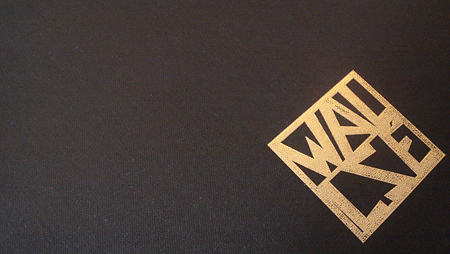 This brings me to what I think of Wallsé. My thesis, if you will. And that is the restaurant is way too expensive and the food is way too simple for that kind of setting and price. The food is good, but not $350 for 4 good (our tab that night). The food was so authentic that it felt like I should be eating it in some small German restaurant in Queens or, like I said, a village in Germany or Austria. There's something very incongruous about paying almost $90 per person for essentially simple, homey food. Very good food, yes, but at the wrong price point and setting. I love Taiwanese food, for example, but I would be pissed to pay that much money in a fancy restaurant for it even if it were fantastic. Some things are just meant to be enjoyed at home or in a homey atmosphere. Now that I've gotten that off my chest, let's move on and take a look at the desserts. This interesting looking thing is called a Salzburger Nockerl ($9). It's basically a meringue in the shape of a hollow ball and filled with a huckleberry sorbet. 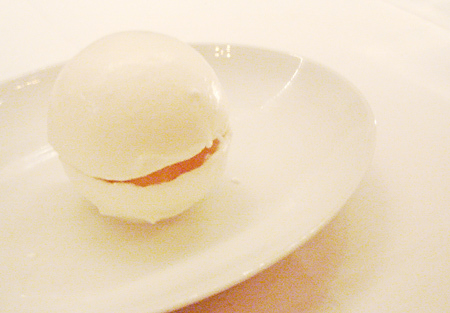 The super light and crispy egg white and sugar shell contrasted perfectly with the tart sorbet on the inside. 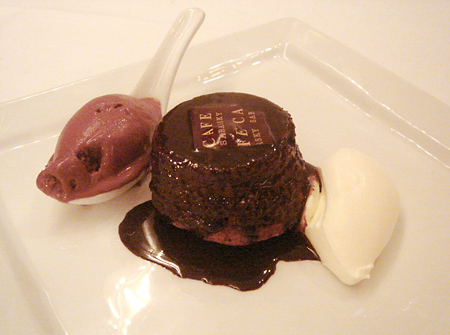 "Mohr im Hemd" Chocolate, Hazelnut Cake and "Mr. Pralus" Chocolate Sorbet ($9). Nothing much to say about it, just a lot of chocolatey goodness, if you are into that sort of thing. 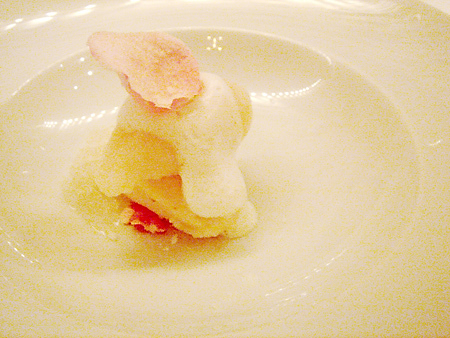 Litchi Sorbet ($6) with Riesling from "Firtz Haag" and a crystallized rose petal. Another solid dessert, which on the whole are what you'd expect from a restaurant at this level. The nockerl was particularly memorable, however. 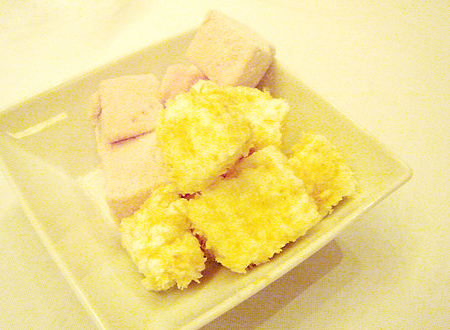 And some super soft marshmellows. 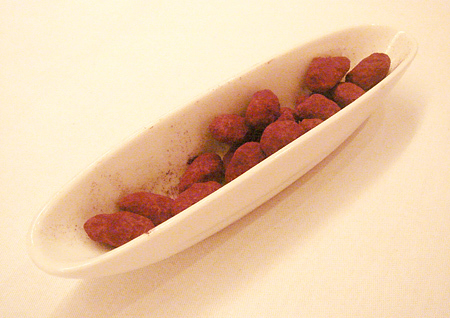 Wallsé, 344 West 11th Street (at Washington Street), (212) 352-2300.